Hello and Stars and Dots! The September Pin-Sights inspiration images feature lots of complementary colors—various shades of blue and orange. So, I decided to focus on the colors and the small picture of a beautiful pattern of little shapes outlined in gold. I don’t know about you, but sometimes the smaller images in a stamp set can go unnoticed and unused. In particular, I’m referring to those tiny embellishment images like little stars, dots, hearts and clusters of the same that come with the set. I honestly love and am fond of these small stamps, so I decide to use them in a more prominent way on a card. I chose small stamp images from 3 Essentials by Ellen Hutson stamp sets and arranged them onto a round acrylic block in a cluster as shown below. The stamp sets from which these small stamp images came are described below in my supply list. 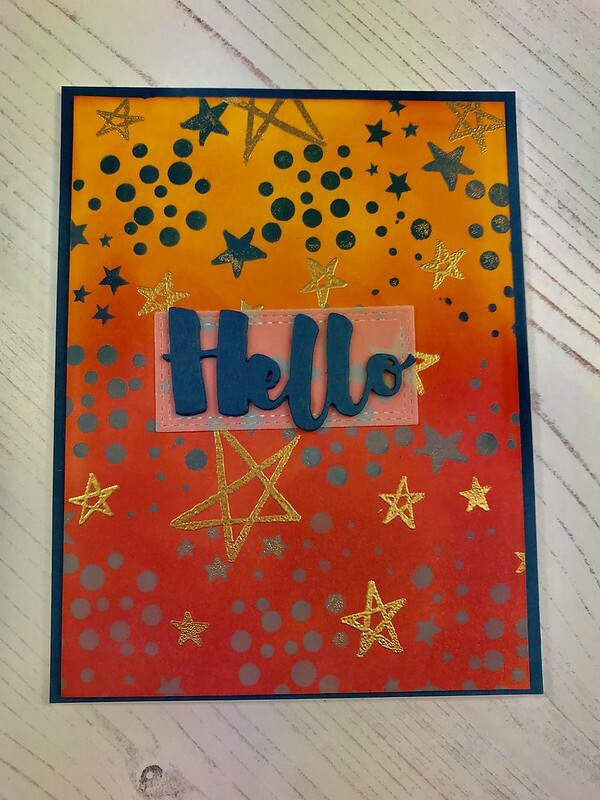 Before stamping this image cluster on my A2 card front, I created an ombre background for front of the card by blending Distress Oxide Inks in shades of yellow-orange, orange and brick. Once the ombre background was dried with my heat tool, I proceeded to stamp the image cluster onto the card front using three shades of blue. I rotated the acrylic block in different ways as I stamped the image cluster. I made sure that I left some open spaces to stamp single star images. I stamped these single images in Versamark ink because I was going to heat emboss the stars using gold embossing powder. (Note: I made sure that the card front was properly prepped with an embossing powder bag before stamping in Versamark.). After applying the gold embossing powder, I removed any stray embossing powder with a small brush before heat embossing. The gold stars really popped against the bright background and the star and dot background. Since the overall background is busy, I used a single, simple die-cut word as a greeting. The hello die is also from Essentials by Ellen and it was die-cut 3 times in dark blue cardstock and glued together for added dimension. The hello was matted onto some vellum cardstock so that it would stand out from the background and then the entire sentiment piece was adhered to the card. I trimmed down the A2 card front to 4” x 5.25” and mounted it onto a mat in the same dark blue cardstock as the sentiment. This was then adhered to a top-folding A2 card base. Essentials by Ellen Brushstroke Christmas (individual stars and small dot cluster). This entry was posted in Challenges, Friendship and tagged Challenge, Ellen Hutson, Essentials by Ellen. Bookmark the permalink.